Fox renewed a pair of Monday dramas on Monday: “9-1-1” and “The Resident” will both return for third seasons, the broadcast network said. 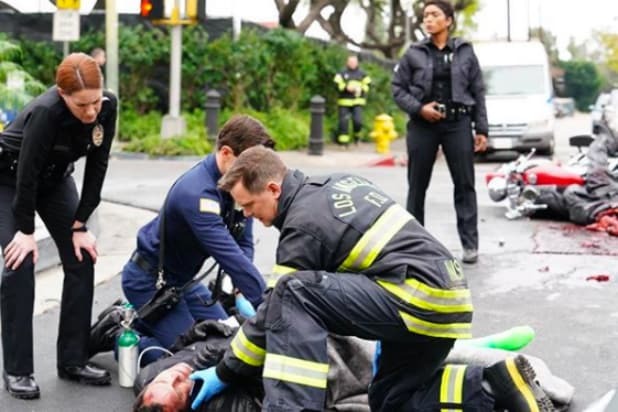 Ryan Murphy’s “9-1-1” — Fox’s top drama series, averaging 15.4 million total viewers per episode when including a week of delayed viewing — follows the high-pressure experiences of first responders. “The Resident” follows Dr. Conrad Hawkins (Matt Czuchry), a senior resident at Chastain Park Memorial Hospital, where he is embroiled in the bureaucratic practices of the hospital industry. Tonight’s new episode of “9-1-1” titled “Chimney Begins” stars Kenneth Choi as Chimney, revisiting his arrival at Station 118, and how he became a firefighter and paramedic. It airs at 9 p.m. ET/PT on Fox. At 8 p.m. ET/PT tonight, the new episode of “The Resident” called “Emergency Contact” guest stars Miles Gaston Villanueva as Alec, who teams up with Dr. Hawkins to help a young gymnast experiencing mysterious symptoms. Jenna Dewan also guest stars as Julian Booth, whose death left unanswered questions to do with corrupt medical device company Quovadis.